Note: Please review this document for assistance with the Caissa's Web Free Chess iPhone application. If you have any further questions, please contact us. 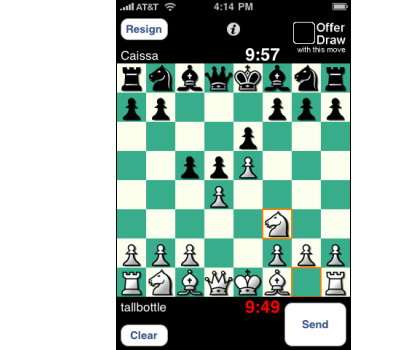 Caissa's Web is pleased to announce the release of our first smart phone application, Caissa's Web Free Chess for the iPhone and iPod Touch (note that the new Caissa application will work on both the iPhone and iPod Touch, however for future reference we will only mention the iPhone). Caissa members using their iPhone can play other members connected to Caissa website using their iPhone, or they can play members connected to Caissa using the standard Caissa browser interface. In order to play live chess using the Caissa app, your iPhone must have either 3G data connectivity or a connection to a wifi hotspot. It can also work on extended data networks, but the quality of your connectivity and game play may vary. 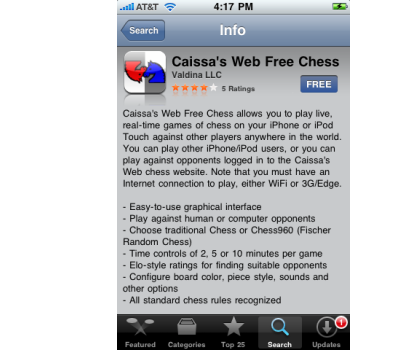 What is the Caissa's Web Free Chess application for iPhone? 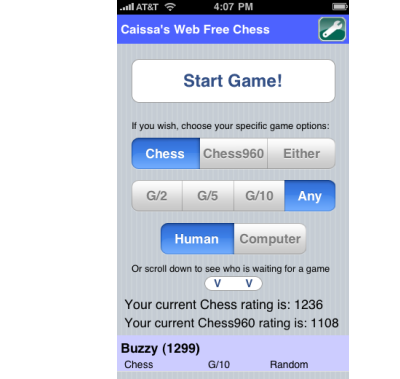 Caissa's Web Free Chess is a software application that runs on the Apple iPhone. It is a "client" or "front-end" interface for interacting with the Caissa's Web server, specifically for the purpose of playing live chess games. It is an alternative to the browser-based interface you access using your desktop or laptop computer. Currently, the app only supports live chess games as they relate to the Caissa website. Features like correspondence games, tournaments, and the scorebook are not currently implemented in the app. They will be added at a later time. I have an iPhone. How do I get the application? There are two ways to get the application. The preferred way is to download and install the application directly to your iPhone. Alternatively, you can download the app to your desktop or laptop iTunes application and then synch your iPhone with iTunes. You can download the app directly to your iPhone by going to the "App Store" icon on your iPhone main menu. Then tap on Search. In the search box at the top of the screen type in Caissa's Web Free Chess. The app will be listed. Tap on the listing and you will see a detail screen (sample image to the right). Tap on the Free button and then Install. The app will be installed and will appear on your iPhone desktop with the familiar Caissa logo icon with the word Chess below. You can also get the app by using the iTunes application on your desktop or laptop computer. Open the iTunes application and choose the iTunes Store from the left menu. Then choose the App Store link in the iTunes Store. In the Search box in the upper right of the screen, type in Caissa's Web Free Chess. The app will be listed. Click on the Free App button in the listing. The app will be downloaded to the Applications menu in the left menu of iTunes. Plug your iPhone into the computer with iTunes. The iPhone should show up as a Device in the left menu. Click on the iPhone device listing. Click on the Applications tab for that device. Click on the Synch button at the bottom right of the screen. Your iPhone will be synched to your iTunes, which will include the app being installed on your iPhone. The app will appear on your iPhone desktop with the familiar Caissa logo icon with the word Chess below. I've downloaded and installed the application. How do I log in? When you first open the app, you will be presented with a login screen. If you already have a Caissa membership, either free or paid, you can use the handle and password from that account to log in. If you are new to Caissa, tap on the "Create New Account" button to create a Caissa account. If you have an existing Caissa membership, simply type in your handle and password and tap the Link To Account button. You will now be logged in to the Caissa website from your iPhone. You can now play live games against any other member logged in to the website at the same time. Live games will be played based on your current live chess ratings on Caissa. Games played using the iPhone app will count toward your rating. Upon completion, all games will be saved to your Scorebook (currently only accessible from the Caissa web interface, not the iPhone app). If you are new to Caissa, choose the Create New Account button. You will be asked to enter a handle (4-16 characters; upper/lower case letters and numbers; no spaces or special symbols), a password (6-16 characters; upper/lower case letters and numbers; your password should not be the same as your handle), valid email address, your country of origin, and a confirmation that you are 13 years of age or older. If everything is properly entered, a new Caissa (free) membership will be created. You will see the main menu and can begin playing live chess. Note that you can use this handle and password to log in to Caissa using your iPhone as well as the web interface at http://www.caissa.com. 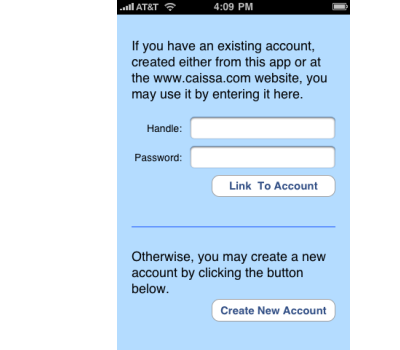 Note: After you log in using the Caissa iPhone app for the first time, your login info will be saved in the app. The next time you tap on the Caissa icon on your iPhone's desktop, you will be automatically logged in to Caissa without having to re-enter your handle and password. You can force the login prompt to reappear by choosing the "Reset Handle/Password" configuration option (more info on this below). Once logged in and connected, you will see the Caissa app's main menu (shown to the right). Here, you can set up game details and put yourself on the Caissa server waiting list to play a human opponent, choose to play a computer opponent (the computer opponent is actually on the Caissa server, not in the iPhone app), or choose a human player that is already on the waiting list. Note that the waiting list you see here is the same as what is seen on the Caissa server, based on appropriate time controls. The app's waiting list is synched automatically to the Caissa server waiting list in real-time. 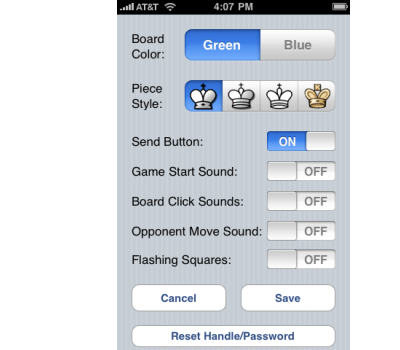 Below is a summary of the 3 options for starting a live chess game using the Caissa iPhone app. To play a live chess game with a human opponent, and you want to specify the game parameters, you can put yourself on the waiting list. The game parameters are as follows: game type (Chess, Chess960, or either), time control (G/2, G/5, G/10, or any). For the type of opponent, make sure you choose human. Now tap on the Start Game! button. If there is already someone on the waiting list with the same parameters, you will be paired immediately. If not, your handle will be placed on the waiting list for another member to choose. While you are waiting to be paired in a game, do not close the Caissa app. This will log you off the server. When someone chooses you off the list, you will see a pairing notice and the game will begin. To play a live chess game against a computer opponent, you should first set up the game parameters (listed above), choose Computer for the opponent and then click the Start Game! button. If you are not choosy about the game parameters, you can choose a member that is already on the list and waiting for a game. On your iPhone screen, scroll down and you will see a list of members waiting for a game and the game parameters they have chosen. Tap on the listing for the opponent you would like to play, and the game will begin. Note: In addition to the live game set up functions, the Caissa app main menu also includes a wrench icon in the top right of the screen. This is a button to the Caissa app configuration options (more info on this below). Once the game is paired, the chess board will appear on the screen. To make a move, tap on the piece you want to move, then tap on the square you want to move to. Again, it is a tap-tap process, not a slide or drag process. Due to the small size of the screen and the corresponding board pieces, it may take a few tries to get the process down. Once your piece has moved to the destination square, press the Send button to send the move to your opponent. Before you press Send, you can use the Clear button to take back the move. You can also choose to turn off the Send button and have the move sent immediately after tapping on the destination square (see customize options below). Other standard features of the game board screen are the time controls in the form of ticking clocks, the player handles, a Draw button, and a Resign button. You can click on the Resign button at any time to resign the game. To offer a draw to your opponent, tap the Offer Draw checkbox, make your move normally, and send it. The draw offer will be sent with the move. If the opponent accepts the draw, the game will end. If they do not accept the draw, your opponent's next move will appear normally. Keep in mind that all completed games are saved to your scorebook on the Caissa website. To access saved games, log on to Caissa using a web browser at http://www.caissa.com. Yes. You can click on the wrench icon in the top right of the Caissa app main menu screen. There are several configuration options you can change to customize the app. Board color. You can choose to have the dark square board colors to be blue or green. Piece style. You can choose from four different piece styles. Send Button. This option turns on/off the button used to send the move to your opponent. Leave this on if you like to make a move, then take some time to think about it (taking the move back if necessary), and then send the move. Turn the Send button off for faster move-making; the move will be sent immediately after you tap on the destination square. Game Start Sound. If you are on the waiting list and waiting for a game to pair, a sound alerting you to the pairing will occur when you have this option turned on. Board Click Sounds. With this on, a sound will occur when you tap (click) on the piece you want to move and then will occur again when you tap the destination square. This can be turned on to help confirm that your tap on the board is registered. Opponent Move Sound. When you receive your opponent's move, a sound will occur if you have this option turned on. This is helpful if your opponent is taking a long time to move and your attention is directed away from your iPhone. You will know it is your move when you hear the sound. Flashing Squares. With this turned on, when your opponent moves the from/to squares will briefly flash so you can easily pinpoint which piece was moved. Once you have chosen your configuration options, you can choose to Cancel or Save your changes. A final option is to Reset Handle/Password. If you would like to enter a new handle and password, click this button. This is useful if you change your password on the Caissa website and must synch that password on your iPhone app, or if you have more than one person using the same iPhone and each has a separate account. To log off the Caissa server and close the Caissa app, press the Home button on your iPhone. This will take you back to your iPhone's desktop. Pressing the home button during a game will automatically resign the game for you and log you off the server. Note: Currently, if you receive a voice phone call while you are playing a game, and you Accept the call, this will automatically resign you from the game and log you off the server. If you Decline the call, the live chess game will proceed normally.